Australians love online shopping. But with more users connecting to the internet to buy their goods and services, it could mean having to sign up or register with a number of websites, and entering or storing your credit card information with multiple vendors. While PayPal has provided an extra layer of security for online purchases, the truth is that digital wallet choices for Aussies are actually few and far between. Today, however, Visa announced that its e-wallet solution V.me will head to Australia "just in time for Christmas". V.me, as described by Visa, will work just like a digitised version of your wallet, securely storing all personal details and major payment card information – which not only includes Visa debit and credit cards, but MasterCard and American Express cards as well. "It's a digital manifestation of what's in your pocket," said Greg Storey, Visa's head of V.me for Asia Pacific, Central Europe, Middle East and Africa. Storey said that at least 33 per cent of smartphone users have shopped online using their phone, and Vipin Kalra, Visa's country manager for Australia said that research showed that 72 per cent of all Australians had shopped online at least once in the past 12 months. But while these numbers have shown to be increasing, Kalra went on to add that research in the US showed that customers were most likely to abandon their purchase at the time of payment because the process required a lengthy form to be filled out. 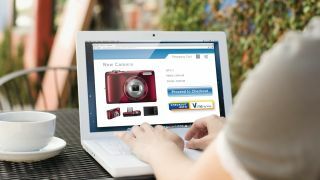 "It addresses some consumer desires, which is for ease, convenience and simplicity when purchasing online," Storey said. Similar to PayPal's solution, after storing all your cards and personal information in V.me, users will be able to make purchases by simply putting in a username and password, which will then let users choose a preselected "default" card or any other card. Visa has a number of merchants already on board, including JB Hi-Fi, Cotton On, City Beach and Lorna Jane, and is in talks with other merchants, including e-commerce and bricks and mortar stores, as well as for travel and bill payments. Like PayPal, merchants will not be able to see all your details, nor will Visa be able to track your transactions. But unlike PayPal, users will not be able to store funds with V.me, just link credit and debit cards to the service. Payments will be made through the financial institutions involved with the transaction, with V.me acting simply as a gateway to your stored information. Visa believes that consumers will feel confident of V.me as it has backing from over 40 financial institutions locally, with three of the four "big banks" named as partners. Though Commonwealth Bank was not named, it may be included by launch later this year. As only a username and password will be needed for most transactions, when asked further about the security of the service, Kalra said that Visa's many layers of encryption, "strong authentication" and device identification will be used to prevent fraud, as well as the ability to set transaction alerts for Visa cards. In any case, Visa cards stored on V.me will also come with the Visa's zero liability policy, where cardholders will not be held responsible for unauthorised or fraudulent transactions. Visa had a small launch for V.me in the US last year and began trialing the new service in Europe late last year. Currently, users in the US, UK, Canada, Spain and France can sign up for the service. Visa is hoping that as it rolls V.me to other regions, online shopping across countries will be made easier and secure as well. "Our vision is to make it a global service… if the [US-based] merchant ships to Australia and if they're accepting V.me on their website, then there is no reason why an Australian consumer can't use their V.me wallet. Our goal is to create that experience for every other country," Kalra said. "Any debit card that is accepted online, could be used in the V.me wallet… Merchants at the end have to decide which cards they accept," he added. From its launch date in Australia, Greg Storey said that users will be able to use V.me essentially straight away with any online stores that utilises Visa's service and ships to Australia. Storey went on to say that with the emergence of e-commerce, V.me will be a platform that evolves with new technologies and consumer trends. One such trend, Kalra said, was that more and more Australians are moving away from cash. Visa sees a future where everyone instead uses NFC-enabled mobile devices for in-store payments through PayWave in conjunction with V.me. "PayWave will move from a piece of plastic to your mobile device, and that's starting to happen already in Australia. At the same time, V.me will come from a PC world to a more mobile world," Kalra said. Storey said that one of the perks of V.me will be that users will still get the visual experience of using their card in this kind of setting, though it will just be in digital form on your mobile device. Loyalty cards and rewards will also be implemented in the future. Storey indicated that further down the road, users could also store prepaid currency cards on V.me as a debit card for use in other countries.